The Havanese, a breed of Bichon type, is the national dog of Cuba, developed from the now extinct Blanquito de la Habana ("little white dog of Havana"). The Blanquito descended from the also now extinct Bichon Tenerife, which was introduced to the Canary Islands by the Cubans. It is believed that the Blanquito was eventually cross-bred with other Bichon types, including the Poodle, to create what is now known as the Havanese. Sometimes referred to as "Havana Silk Dogs," this was originally another name for the Blanquito de la Habana. 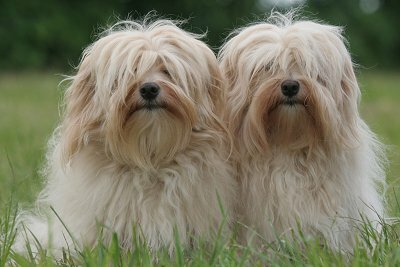 The Havanese is small in size and sturdy in structure with a tail carried over its back and ears that drop and fold. The coat is abundant, long, and silky and comes in all colors. The Havanese has a spirited personality and a curious disposition, and is notable for its springy gait, a characteristic that distinguishes the breed from all others.The Havanese is considered an ideal family pet and a true companion dog. They are highly adaptable to almost any environment, and their only desire is to be with their human companions. Because of their strong social needs, Havanese will not thrive in an environment where they are isolated for several hours each day. 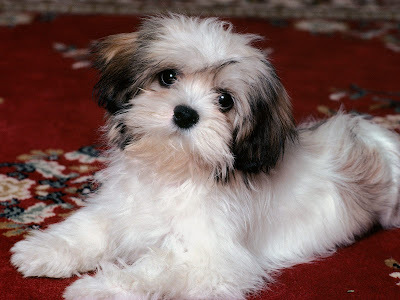 The Havanese, while a toy dog, is sturdy and does not appear fragile or overly delicate. Weight can vary greatly, but most are from 10 to 16 pounds (4.5 to 7.3 kg). Height is 8.5 to 11.5 inches (22 to 29 cm), with the ideal being 9 to 10.5 inches (23 to 27 cm), at the withers. The body, measured from point of shoulder to point of buttocks, is slightly longer than the height at the withers, giving the dog the appearance of being slightly longer than tall. The length of the body results from the long ribcage, not the loins. A unique aspect of the breed is the topline, which rises just slightly from withers to croup, creating a topline that is straight but not level. This breed is renowned for their flashy, lively gait. When on the move, their strong rear drive and slightly shorter upper arm combine to produce a springy motion rather than a far-reaching one. The angle of the topline does not change while moving at a natural gait. The muzzle is full and tapers slightly at the nose. It does not have the appearance of being short or snipy. Length of skull measured from stop to point of occiput is equal to the length of muzzle. The top of the skull is rather flat and the backskull is rounded. The length from foot to elbow is equal to the length from elbow to withers. The forechest is pronounced. When is a standing position, the sternum lines up with the elbows, creating a deep chest. Ribs are well-sprung and the abdomen is moderately tucked up. The Havanese has dark brown eyes and almond-shaped lids surrounded by black pigment. The ears, when extended, reach half way to the nose. They arc slightly upward at the base and hang down on the sides of the head without touching the face. The tail is carried arched forward up over the back. While the tail's long plume of hair falls on the body, the tail itself never touches the back. The breed standard notes that except for slight trimming around the feet to allow for a tidy foot, they are to be shown untrimmed; any further trimming, back-combing, or other fussing is against type and will not be allowed to the point of precluding placement in dog shows. The breed standard specifies that the tail may not be docked. The American Kennel Club Standard allows head furnishings above each eye to be held in two small braids secured with plain elastic bands. However, many owners prefer to clip their pet's hair short for easy upkeep.